Psychophysical theory exists in two distinct forms -- one ascribes the explanation of phenomena and empirical laws to sensory processes. Context effects arising through the use of particular methods are an unwanted nuisance whose influence must be eliminated so that one isolates the "true" sensory scale. The other considers psychophysics only in terms of cognitive variables such as the judgment strategies induced by instructions and response biases. Sensory factors play a minor role in cognitive approaches. This work admits the validity of both forms of theory by arguing that the same empirical phenomena should be conceptualized in two alternative, apparently contradictory, ways. This acceptance of opposites is necessary because some empirical phenomena are best explained in terms of sensory processes, while others are best ascribed to central causes. The complementarity theory stresses the "mutually completing" nature of two distinct models. The first assigns importance to populations of sensory neurons acting in the aggregate and is formulated to deal with sensory effects. The second assigns importance to judgment uncertainty and to the subject strategies induced by experimental procedures. This model is formulated to explain context effects. 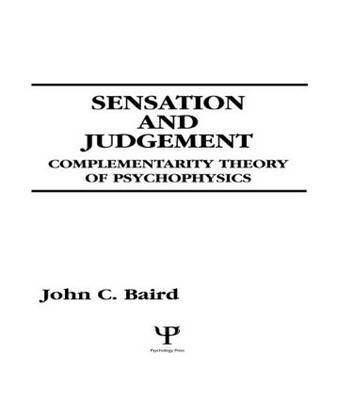 Throughout the text, the exposition is interlaced with mathematics, graphs, and computer simulations designed to reveal the complementary nature of psychophysical explanations.